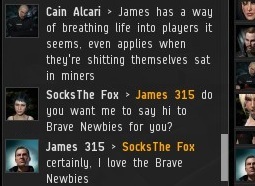 You know what that whining sound means: Either your computer is overheating or it's time for another edition of the Highsec Miner Grab Bag! Someone claiming to be Mine Teck left the following comment on an earlier post: "Mine Teck here. By recording TS whit out asking me. I think is is against the law, and then publish it. Again whit out asking." It sounds like Mine Teck has fallen in with a bad crowd. Could the resistance be creating its own space law firm? 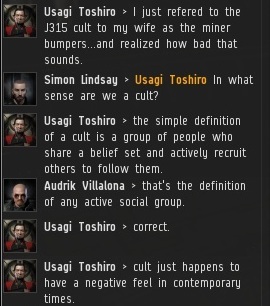 I can't understand what iMiner v2 is going on about. 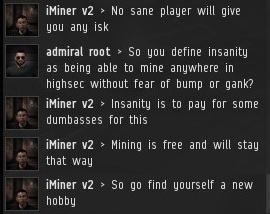 Mining in highsec costs 10 million isk and it has been that way for a long time. I may not be fluent in Russian yet, but I am getting a working knowledge of badly-translated Russian. The inclusion of the word "creature" is a dead giveaway. I don't know if Qroni meant to give off such mixed signals. Did she tell Agent Ophidia Black that she could continue supporting herself? One can only guess at the number of conversations that take place about me each day. All good "crap", I hope. As we all know, I am a rock star. Authorized Pixel Distributor attempted to play one of Erotica 1's bonus games and wasn't very happy about the result. But at least she got to meet a celebrity. Father. Supreme Protector. Saviour. Life-Breather. Some people say that dreams are merely the byproduct of randomly-firing neurons. But Chinfist makes so much sense here that it couldn't possibly be the case. People have crafted elaborate explanations for why I do what I do. Conspiracy theories and psychoanalyses abound. It's simple, really: Helping others makes a good man feel good. What Agent Galaxy Pig accomplished here is called a "clean gank". I don't know Agent Simon Lindsay's policy, but I'll pay just about any spam fee to reach out to the people I have bumped. It's like planting a seed; in the long run, it's worth it. 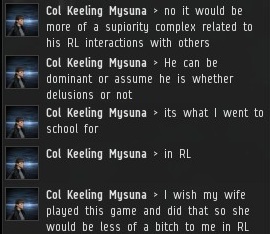 I offer this challenge to any married man who mines in highsec. 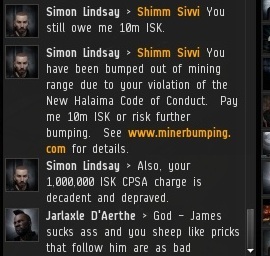 Explain to your wife what the New Order charges for a mining fee, and what the consequences of not paying are. I'm confident that many of you will get some good sense talked into you. In two days, Dustas lost two exhumers and two pods to the New Order. 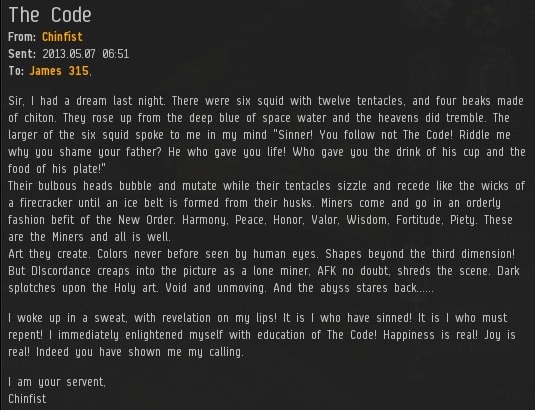 To save time, he CC'ed his tears to all of the responsible Agents in a single EVEmail. Now that's efficient! I like how Dustas lost a badly tanked Mackinaw and a bunch of expensive implants, and his response the next day was to buy a completely untanked Mackinaw and new expensive implants. And to mine in the same system as before. I like to gank 'em clean so nothing goes to waste when they inevitably return to WoW. Dios Mio man! You are not a conservationist, you are a saint! I play Wow while ice mining. I know that the New Order won't gank me because they are not very good. I am a realist. "I know that the New Order won't gank me because they are not very good. I am a realist." 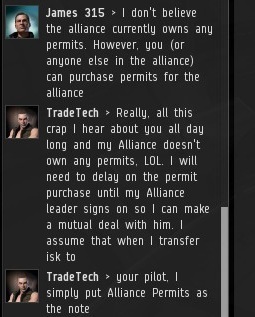 Translation: I've been ganked 5 times by the NO already, which is why I don't give out my real pilot name and continue to pretend that I've never been ganked by the NO. I swear I got three words into that before I felt drunk and I don't know why. 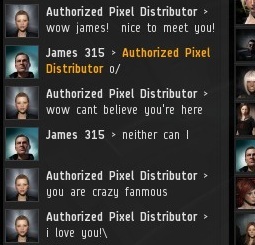 James, I'm a permit holder who currently mines in high sec for an hour or so a day. I'm just wondering how the Odyssey patch will effect me and my ability to mine compliantly. There's many issues that are unclear to me, for example will my current mining permit work in the new ice belts or will you be introducing a new ice mining permit (and if so can you buy them both as a bundle at a discount)? Will you be clarifying these issues prior to the patch so that we know how Odyssey will effect us? Why should oddysey change anything about the way the new order operates? the permits will keep their validity and the new order will continue the work of the righteus. Good News Everyone. Never lost a barge, exhumer, orca or so much as an ice lolly to the New Order so no whining from me. No whining from you? You are one of the loudest whiners, you filled for months every Miner Bumping post with your caring comments. You are obsessed by the New Order. Your mild insults are no less whines then the tears from ganked miners. Behold the bitterness of Bobbins, born of the bog of broken barges. Only the point was no barges are actually broken. If only bumping terrified me but it doesn't. So bump away and cry about tanks being too strong. He won't fess up and post under his player name. I'm the one without the minerbumping.com sticker in the bio. Now come and get me. 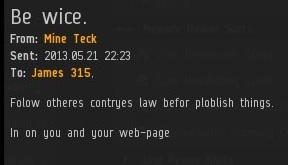 But seriously you know how highsec game mechanics work. Creating a dipstick character for you not to be able to gank is simply stupid. Just ask James315 in his invincible stabber.